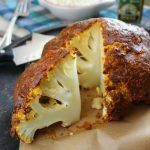 Spice-encrusted and slow-roasted, this cauliflower emerges from the oven looking impossibly beautiful and just fork tender. Wash cauliflower and remove any leaves, as well as the stalk if it sticks out at the bottom. This will allow the cauliflower to sit level while baking. Preheat the oven to 400º and line a baking sheet with foil or parchment. Combine all of the seasonings and oil in a small bowl and mix together using a spoon until well combined. The mixture should look like a thick paste. Use a marinading brush or your hands to spread the paste over the entire cauliflower. If you’ve got any handy, a plastic glove is a good idea for this step. Otherwise, you’ll end up with some stained fingers! Place on baking sheet and cook for 1 hour or so, until the cauliflower is fork tender. If it appears to be drying out, drizzle a bit of olive oil or water lightly over top.